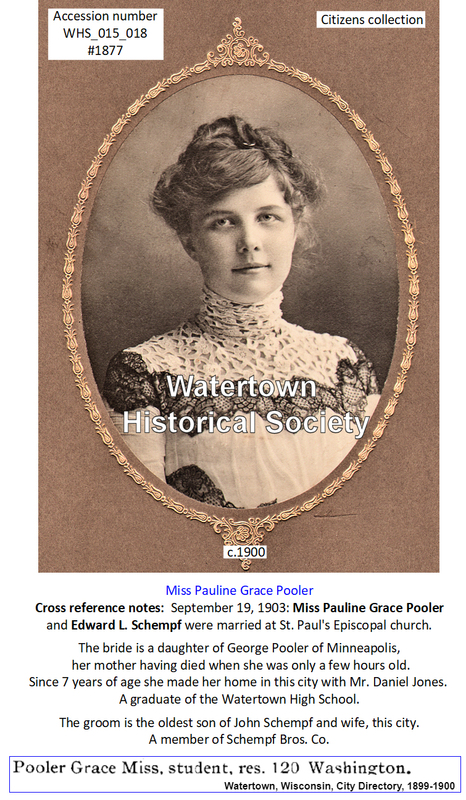 In 1866, Mr. Donald Scott, after returning to Watertown, was married to Miss Emma Stewart Leonard, who died in 1901. She was a niece of the late Col. Daniel Jones. The tower up to the bell is of Watertown brick, the belfry is of massive timbers, and has ample room for a full peal of bells. The spire is very neat and simple, its graceful outlines calling for no fretted ornamentation whatever, its apex is surmounted by a well-proportioned gilded cross. The height from the ground to the top of the cross is 87 feet 10 Inches. The design and execution of the work has been done by Dornfeld, architect and builder, and is in perfect keeping with the architecture of the rest of church building, chapel and rectory, the whole forming a beautiful pile of ecclesiastical structures, an ornament to the city and a credit to all concerned as well as a cherished mecca of the church people of Watertown. 01 15 Col. Daniel Jones, an honored and prominent citizen of Watertown for nearly sixty years, died at his home in Washington Street at 7 o'clock Sunday evening, January 15, 1905. Though Mr. Jones was in feeble health for years, his end came sooner than his relatives and friends expected. On Thursday he was downtown transacting business, and on Friday he complained of having a cold. He gradually grew weaker and passed away as peacefully as a child going to sleep. His death was a great surprise to our people, for but few knew that he had been ill or had been confined to his home. In the death of Mr. Jones, Watertown loses one of its most successful business men, and a man who has aided and financed many an enterprise here that has build up our beautiful city. He was a conservative, honorable business man, a man whose judgment and word could always be relied upon, and a man who always dealt justly with all classes, hence his death is universally regretted here. He was a kind neighbor and took much delight in the success of his fellowman, being particularly interested in the welfare of the young. Mr. Jones was born at Goffstown, New Hampshire, October 31, 1815, hence was in his 90th year when he died. When quite young he removed with his parents to Jefferson County, New York, and from there to Oneida County, New York. In 1843 he came west and located in Milwaukee, where he engaged in the mercantile business and for a year in connection with a partner conducted the American House in that city. In October, 1845, he came to Watertown and opened a store; in 1852 he opened a banking and exchange office in connection with his store and organized the Jefferson County Bank in 1853, which he continued until 1865, when the present Wisconsin National Bank was organized by Mr. Jones in company with the late Wm. M. Dennis, Peter V. Brown, Henry Mulberger and Charles Jacobi. Mr. Dennis was president of the bank for many years, and after his death Mr. Jones was elected president of the bank and remained its president until his advanced years caused him to retire from active business a few years ago Aside from his banking business he remained in the mercantile business until 1864, when he associated himself with the late S. Ford & Co. in the manufacture of woolen goods, and later conducted the business under the name of D. Jones & Co. He continued this business till 1877 when he leased it to D. P. Price. He was also personally connected with various other enterprises here, and held many local offices, at one time serving as chairman of the County Board of Supervisors. In 1875 he organized the Marathon County Bank at Wausau and was its president for many years. Politically he was always a democrat and received the title of Colonel as a member of Ex-Governor Taylor's staff. October 30, 1843, he was married to Miss Elizabeth Harger, a native of Denmark, New York, who died March 11, 1890. He was a member of St. Paul's Episcopal Church for over 50 years, which he helped to organize and has been a member thereof during all that time. He is survived by one sister, Mrs. Lydia M. Beaman, who has made her home with him since the death of his wife. "It was in the spring of 1843 when I landed in Milwaukee and went into the general merchandise business. I sold everything from a paper of pins to a log chain. About a year after I reached Milwaukee I went into partnership with J. L. Bean and we had the American House. ”In the spring of 1845 we sold out to a man named Rossiter from Chicago, and I loaded my goods into a wagon and came to Watertown. “The roads were not what they are today. I remember it took me two days to make the trip in a light wagon with a good team. There were mudholes ten feet deep and we traveled on corduroy roads. There was nothing here at that time, but people were coming fast. It was so crowded at the tavern where we stopped that my wife and myself were obliged to share our room with another young couple, having a blanket as partition. “I started a general store and it was through this that I finally got into the banking business. Most of the settlers came from the east and they brought drafts with them. They would buy goods at the store and offer the drafts in payment. Often they would be larger than I could change and they would leave them with me to change for them. This had to be done through the Milwaukee banks and I finally determined to go into the business myself. In the spring of 1852 I opened the D. Jones exchange office. “In 1853 the state banking law was passed, and with my brother-in-law, C. J. Harger, as a partner [note: also brother-in-law of Ashley Harger? ], the Jefferson County Bank with a capital of $75,000 was organized. We took circulation to that amount secured by $56,000 Missouri state bonds and $30,000 California gold bonds. Everything ran smoothly until the war and the people began to demand gold for our notes. The Missouri bonds we had bought at 83c on the dollar and they went down to 38. We sold the California bonds which were always at par and with this money started in to take up our notes as fast as they were presented. Gold was at a premium of from 13 to 100 percent at this time. To help out we shipped produce, beef and pork to New York, ordering gold back. Sometimes it was a tight squeeze to get enough gold from New York to carry us through the day, but we did it and I am proud of it. We had succeeded in taking up all but about $14,000 of our circulation when specie payment was suspended. In the fall of 1854 the Jefferson County Bank was closed. “When the St Paul Railroad came here it was so poor that I couldn’t pay for the wood it needed to run its engines. Alexander Mitchell was a great friend of mine and he told me that if I would pay for the wood he would see that I didn't lose by it. For two years I bought the wood for it. When the Chicago & Northwestern got this far it couldn’t get its iron, which was in bond. With several others I signed the bond that released the rails and permitted the road to go on. These acts cost me dear. “I was one of the originators of the Plank road, between Portland and Oconomowoc, and it was a good investment until the railroads came through. They ruined the business and I lost what I had in the enterprise. “In February 1856, the Wisconsin National Bank of Watertown was organized. The organizers were William M. Dennis, Peter V. Brown, Henry Mulberger, Charles Jacobi and myself. I alone am living. “In 1876 I organized the Marathon County Bank at Wausau and still retain an interest in it." Wednesday afternoon Mr. Jones' funeral took place from his late home to St. Paul’s Episcopal Church, Rev. John Barrett being the officiating clergyman, who preached a most eloquent tribute to the memory of the departed. The full church choir was assisted by a male quartette composed of Messrs. Julius Wiggenhorn, Fred Lehmann, William Sproesser and Max Rohr. The remains of the deceased were placed in the vault at Oak Hill Cemetery and later on will be placed in their final resting place in the cemetery.